This quote from our player Will is so very, very important. 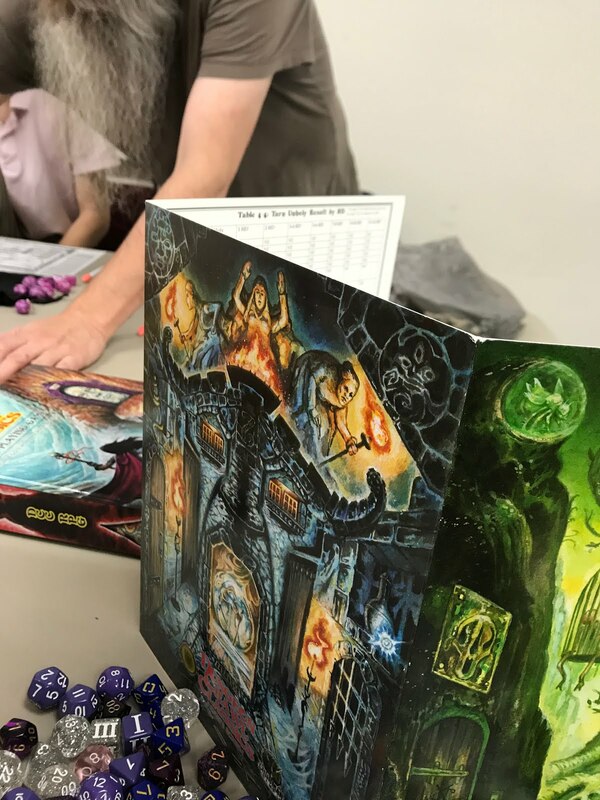 Embedded in those words are the heart and soul of our Road Crew campaign (that is increasingly becoming NOT a Road Crew campaign but just a regular store game... which is totally fine with me.) If that quote doesn't seem to make sense don't worry. It doesn't make sense to me either, and yet it totally does. 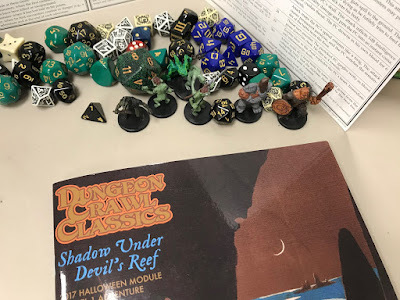 During today's session of Jon Hook's Shadow Under Devil's Reef, our party finally completed the adventure using a combination of quick thinking, fishy spell-casting, froggy clerical magic, and high die rolling. 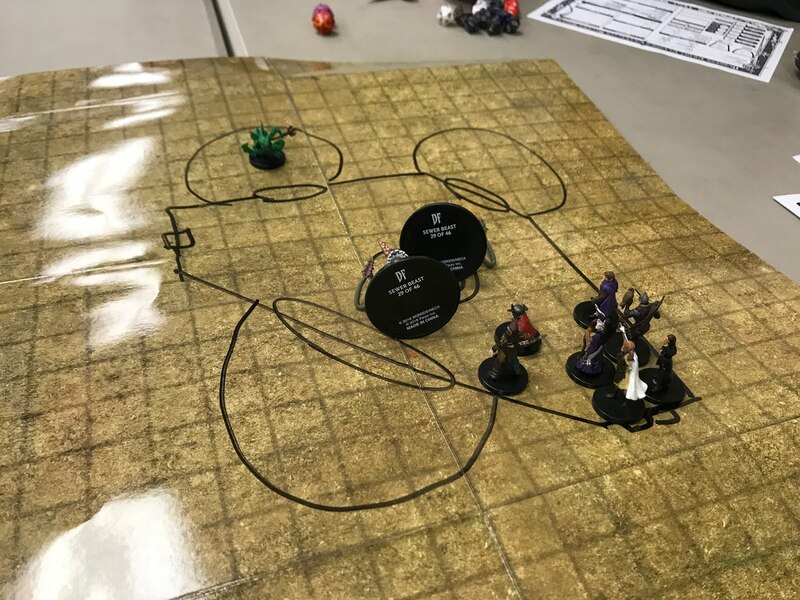 A very well cast Paralysis spell from Turd Fergeson essentially one-shotted the boss encounter. That was the kind of day I was having as a Judge. 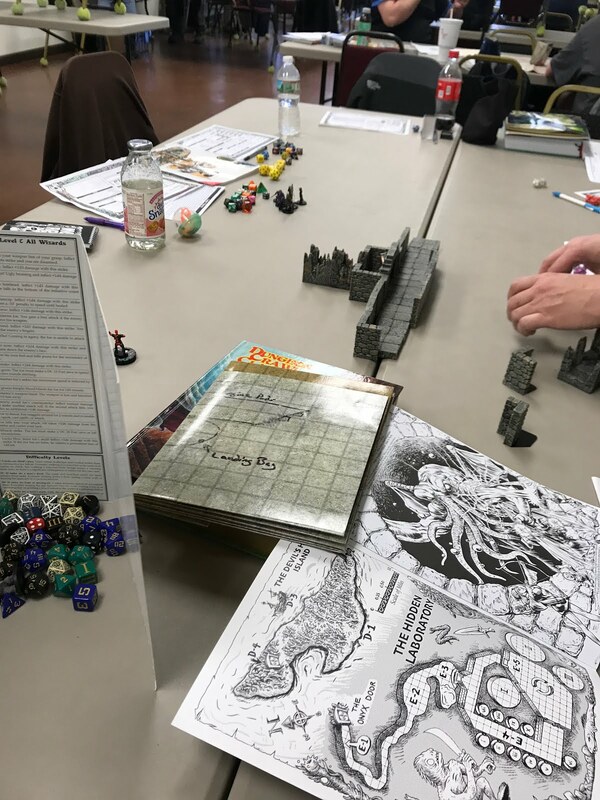 At the end of the session, I made a comment that the party beat me quickly with the high rolling. All the players seemed surprised that I would take an adversarial tone against the them in my games. 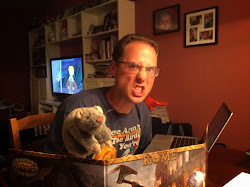 Sorry guys, I'm here to roll dice and kill characters. Unfortunately I didn't kill any characters today, but I came close a few times. And there's always next time. 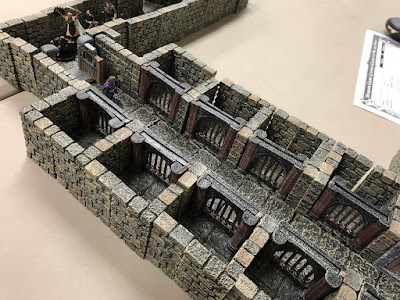 As an added bonus, Robert brought a whole mess of Dwarven Forge for us to use for the game. 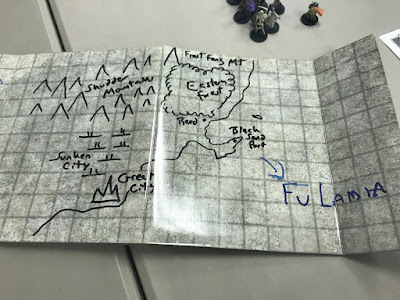 I had SO MUCH fun with the caverns and dungeons, and can't wait for my own swag to come next year! I've gotta wait a long time, but after seeing the stuff in play, it's gonna be worth it. Partially possessed by the soul of a magic door named... Door. Door can grant Marco aid in dealing with other doors, at a cost. Wielder of the Demon's Claw, an enchanted scimitar from Fu-Lamia. The party opened the great onyx door leading down into the depths of Devil's Horn Island. Time was of the essence, because the more time the party spent on Devil's Horn Island, the more they mutated into fish/amphibian beasts. The sloping passage was super cramped. Halfway down there was a four foot gap spanning a pit. Seemed easy to cross! Marco played scout throughout the adventure, and during this first segment he easily crossed the gap. 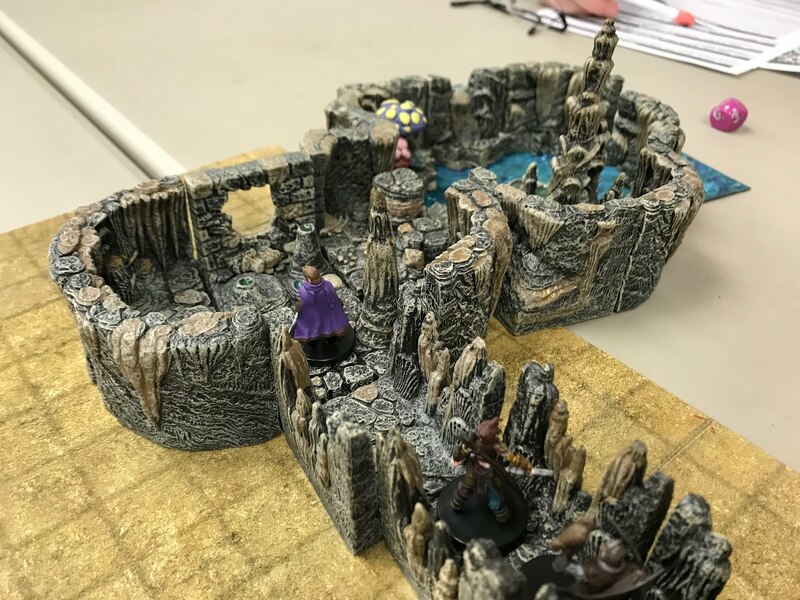 Unfortunately, the tentacle beast at the bottom of the crevasse wasn't thrilled to see a meal get away. 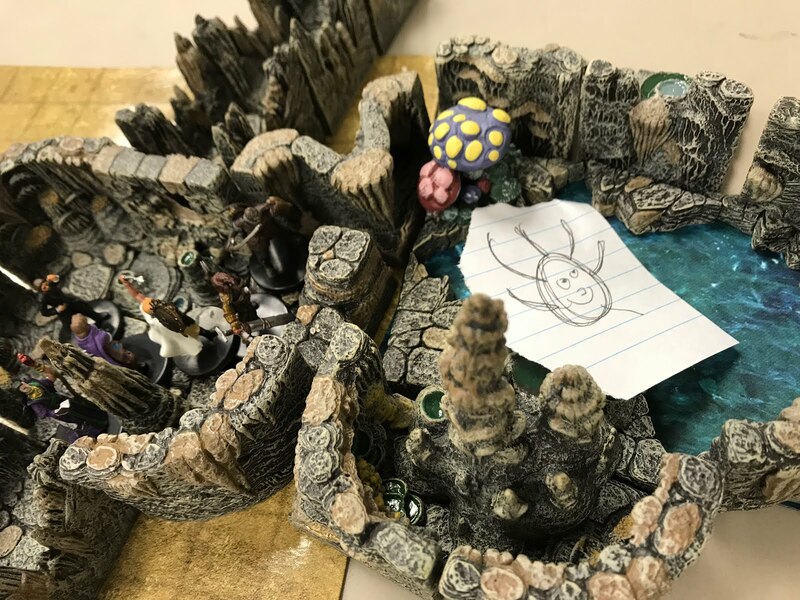 As the rest of the party tried crossing, he beast would try to devour Lars and Turd Fergeson. To distract the horror, Bueno summoned forth a feast of food, and dumped it atop the creature. While the thing ate the food of Bobugbubulz, Tonya charged forward and skewered. Moving into the next chamber, the party discovered six mutated Fu-Lamians. 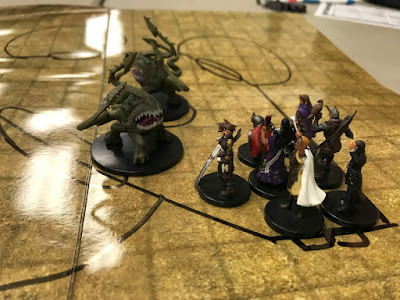 Five of them were only slightly mutated, much like some of the party members. But one was huge, much further along than his associates. 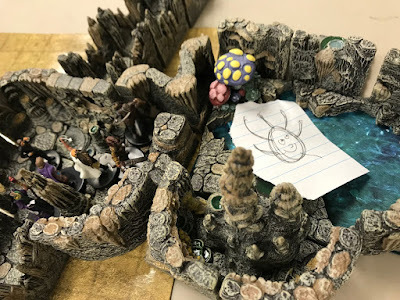 The lead mutated Fu-Lamian didn't want to let the non-mutated party members past. Tonya wasn't about to be told what to do. The two troupes threw down. Before too much blood was spilled, Steve James cast Sleep on all the mutants. What a peaceful way to end the combat! That's when Tonya walked up and lopped the head off of the lead mutant. The next chamber featured a small portal leading further down, with a rather large pool to the right. Each party member who entered the chamber was psychically "called" by something in the water. Marco and Larkin easily resisted the call of this unknown evil, but Bueno and Tonya were not so fortunate. As soon as they entered the chamber, they dropped their weapons and headed for the pool. Realizing that it could be dark magic at work, Turd Fergeson ran into the room while casting Protection from Evil. The spell worked, breaking the hold on both Tonya and Bueno. That's when the evil arose from the water. 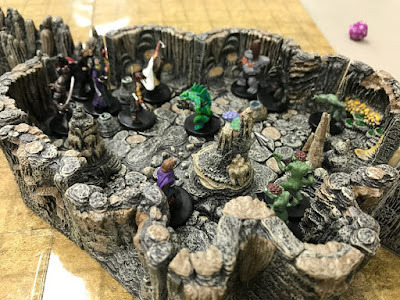 The massive shambling mound of tentacles, eyes, and human mouths was truly terrible to behold. The slap of its limbs caused terrible acid burns, as Larkin realized when she was attacked. Tonya collected the party, and had them evacuate from the chamber, while Steve James cast a Sleep spell in retreat. The spell worked! The monster collapsed into the water. Earlier, Marco had chucked a dagger at the beast, so he tried to collect it from the pool. Unfortunately, there was enough acid in the water that he burned his hands when he tried. Thirty feet down the corridor, the party came to a door. A magic door. The Judge revealed that the locked door was "humming." The players made fun of the humming, and mocked the Judge. They made sounds as if the "humming" was musical in nature. So the Judge complied. 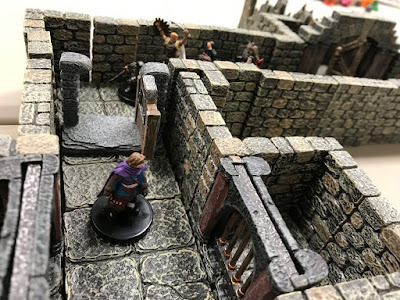 "Door" was a jovial sort, very eager to see the rest of the dungeon. Door offered Marco a means to open him. If Marco agreed to take Door with him, Door would open up. ... that'll change with time. 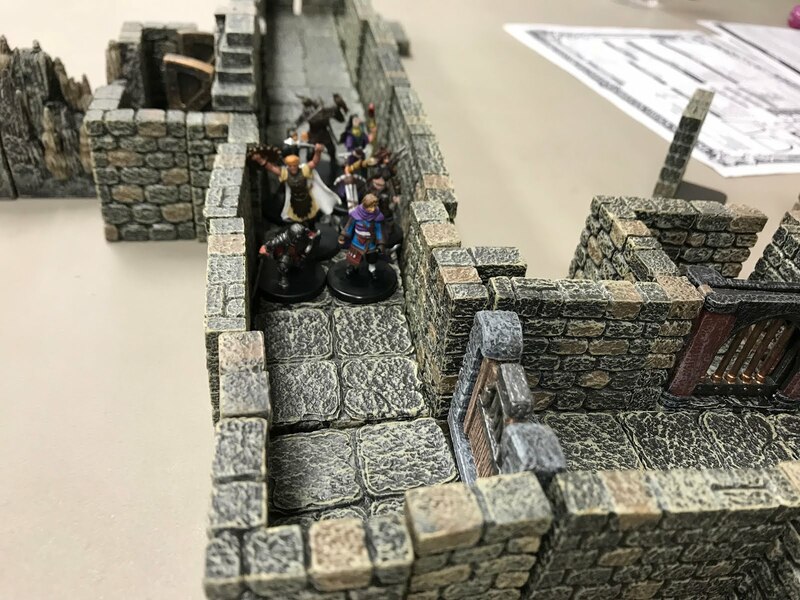 Even though it cost the party's thief part of his soul, the team let Marco lead the way down a long hall to another door. Door made Marco wave at his "friend." 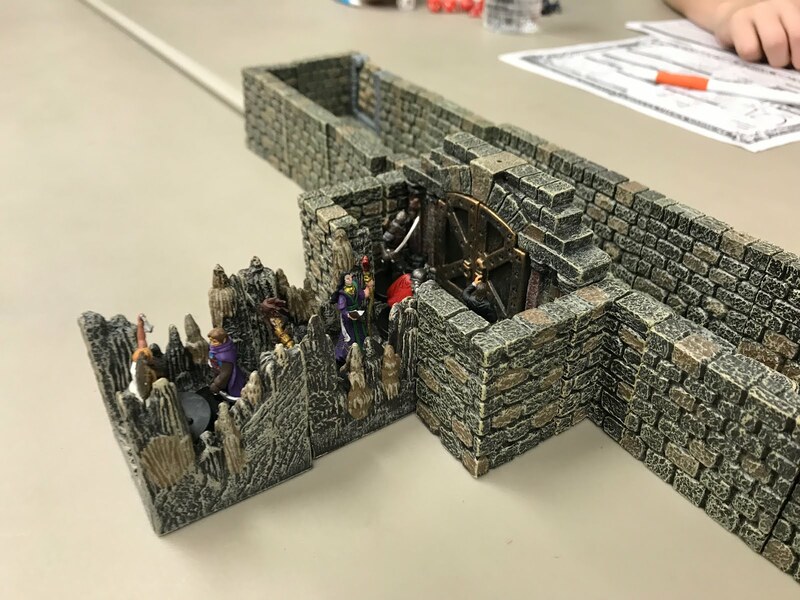 This was when the party realized that the possession had taken place. The next hallway was bizarre. A series of chambers, some holding tentacles, others holding imprisoned Fu-Lamians that were being transformed into tentacles. There were a few open chambers, and the most mutated of the bunch - Steve James - had to struggle to not throw himself into the vacant room. Actually Tonya did the struggling, as she wrestled the party's wizard away from an attempted suicide. Once at the end of the hallway, there was a locked door. Marco tried unlocking the portal but failed. That's when Door offered to help. Marco agreed to let Door take control of his arms. This unlocked the door, but again... at a cost. I should point out that the mechanic I used for this was a simple percentile system. At the beginning of their arrangement, Marco was in control of 80% of his body while Door was in control of 20%. Every time Marco gives in to Door he will trade 2d10% of control. This act cost him 19%. The current scoreboard is now 61% to 39%. 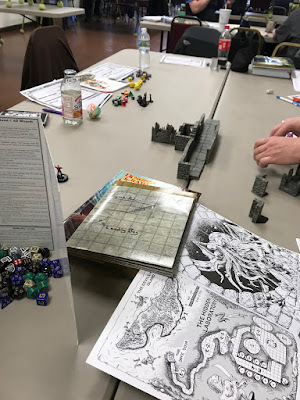 As the party moved into the chamber, they found a pair of Elder Things working a control panel. Three great, glass chambers were attached to the central room, each holding weird creatures floating in water. One held a large, injured starfish thing. The other held a dead starfish thing. The final chamber held a fully transformed, amphibian Princess Kaeko, along with her attendants. The Elder Things weren't about to let the party rescue the princess! The two aliens charged the party, met quickly by Tonya. But Turd Fergeson wasn't in the mood for a long, drawn out battle. He cast Paralysis (and got a 25) and both aliens were immediately stunned and on the ground. Rather than a great, magnificent clash of blades and spells, the boss battle was finished like a bar room brawl. The party encircled the aliens and bludgeoned them to death with fists, pole-arms, and Tonya's crowbar. Because blades didn't work that well. With the Elder Things dead, the party used the central console to release the princess. Unfortunately her mind was not her own, and the same went for her attendants. Steve James cast Sleep on two of her attendants while Lars slew the other two. The princess's precious PsiSpider, carried by Larkin, then freed the mind of her mistress. 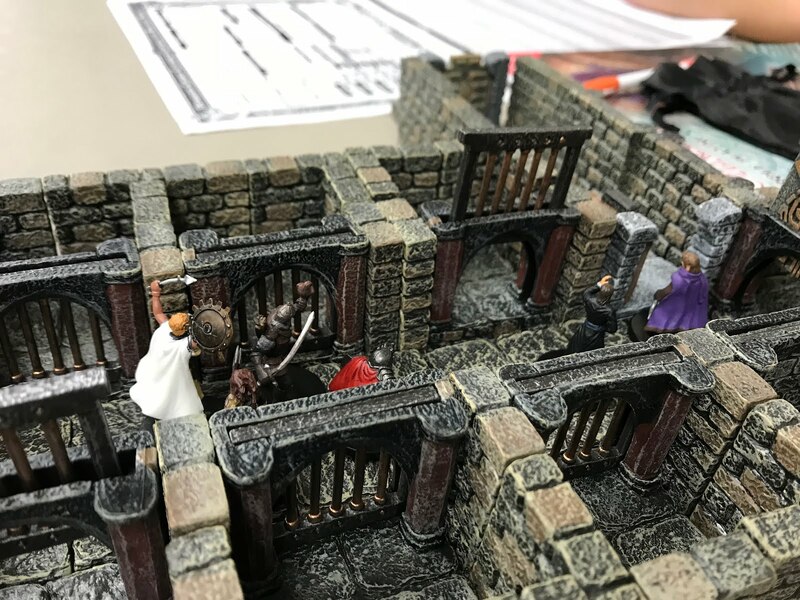 Together, the party fled the dungeon before anything else terrible could give chase. Once back in Black Sand Port, the team received their reward with a healthy dash of glory! "They're not fish! They're cephalopods!" - For some reason this made a different to Lars. "We fight the fish with the fish." - Steve James being the Steve James. "Run!" - Tonya grabs the party, and pulls them out of the dungeon before more eldritch terrors could ruin her day. 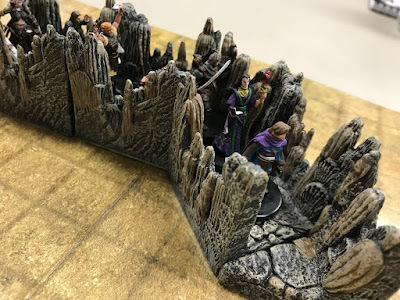 With Princess Kaeko saved, would the party's good standing in Black Sand Port be of any benefit? Now that he was possessed by Door, was it only a matter of time before Marco lost his own soul? I think our adventuring party will be headed back to sea for Moon Slaves of the Cannibal Kingdom!